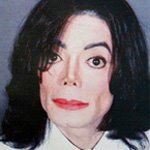 Michael Jackson and plastic surgery...continued! There has been a lot said about Michael's claims that his skin has lightened over the years due to a medical condition called vitiligo. I do not believe that his skin can become so evenly white solely from vitiligo. 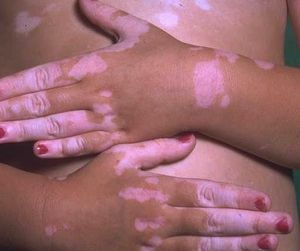 Vitiligo is a bona fide skin disorder which causes the skin to lose pigment in areas. These areas are usually patchy, such as seen in the photo above from wikipedia. It appears much more likely to me that Michael has been bleaching his skin using one or more of the topical skin lighteners which are available. This way he can get the even white color he currently has. What is the dead giveaway to this? Look at his hands, specifically his fingernails. It is impossible to get the skin bleaching cream under the nails, and therefore the skin under the nails should remain dark. If you've seen any interviews of him when he isn't wearing gloves, his nails look odd. They are darker than the surrounding skin. In my opinion, this is the most obvious sign that he's been bleaching his skin. It may also be a reason why he wears gloves so often. Vitiligo??? More like Clorox!!! Michael Jackson and bad plastic surgery: What do they have in common? It appears everything! The time has finally come for me to comment on the Gloved One, and we will start with his nose. It appears that Michael has had more than one rhinoplasty (no surprise to anyone). If you look at his album covers, I think he had one before "Thriller" which caused his nose to look a little thinner. He looked great at that time and should not have had anything more done. Unfortunately, a few years later he released "Bad." This is when I believe he began looking a bit odd. Things have obviously gone downhill from there, culminating in his appearance in court a few years ago where it appeared that an implant may be protruding through the skin of his nose. So what can be done to make his nose look better? Can anything be done to save Michael, or at least Bubbles the chimp?? Because he likely has so much scar tissue left after several surgeries, the best chance to rebuild his nose would be to treat it as a reconstructive surgery. With people who have cancer of the nose, it can be rebuilt by taking skin from the forehead and moving it to the nose to cover the cartilage. I believe that this surgery would be his best option to look normal again. Any bets on him doing it? Angelina Jolie has made the cover of People's Most Beautiful People issue. I've had a lot of people ask me what I think about her lips. I believe that Angelina is one of the few people in Hollywood who is blessed with naturally full, luscious lips. While she may get some help from collagen at times, she appears to be as natural as can be. One way to tell if lips are natural or done is to compare the upper to the lower lip. The lower lip is naturally approximately 1.5 times the size of the upper lip. People who have their lips done poorly often have upper lips which are the same size or larger than their lower lips. Two others whom I believe also have naturally large lips are Scarlett Johanssen and Julia Roberts. Sorry, Lisa Rinna. Has DJ AM had a tummy tuck? PerezHilton.com reports that Nicole Richie's fiance had around 20 lbs removed via an abdominoplasty. Apparently he's had gastric bypass surgery and lost over 150 lbs since then. The tummy tuck is a very common surgery after gastric bypass or major weight loss. Twenty pounds is quite a bit to remove, although not all that uncommon for people who have lost so much weight. Unfortunately, there are major scars with this surgery which must be accepted by the patient. With time, they fade but never completely go away. Kind of like "The Simple Life" TV show?? This has nothing to do with plastic surgery but I thought I'd put a photo of the most adorable dog in the world up. 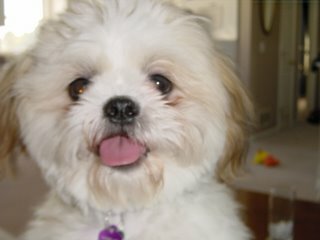 This is my little Shih Tzu. 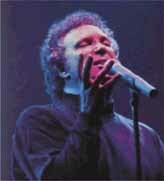 Tom Jones wants more plastic surgery? Click the following link to find out what the crooner is thinking about with plastic surgery. Has Tori Spelling had a breast augmentation? The current issue of In Touch Weekly magazine has my comments on the noTORIous one and her chest. It also mentions this very blog. Click on the above photo to read it. Thanks to In Touch Weekly magazine and D.E. for the nice mention! To view a video of a breast augmentation I performed for Fox News, click here. 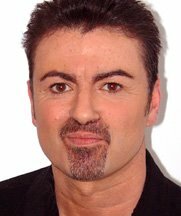 Is George Michael a good father figure for plastic surgery? He looks quite a bit different from his "Faith" days. I think a large part of it stems from a bit of weight gain as he has gotten older (most people gain about 10 lbs every decade). He may also have had a browlift and upper blepharoplasty as well, causing his eyelids to look smaller (see Kenny Rogers). No matter, he still has a pretty impressive set of pipes! 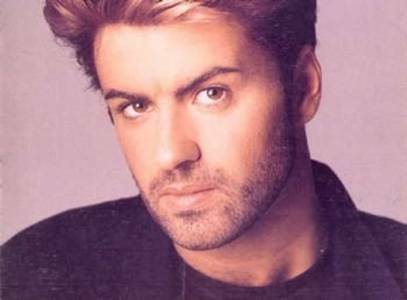 I think he is one of the best pop singers ever. He made a great return recently at American Idol. The song was a bit depressing, but it is nice to see him back in the spotlight. I will be interviewed on a local Detroit radio show, Motor City Middays 97.1 Free FM tomorrow (Wednesday April 19th) at 2pm. For those of you interested, it will be streaming live on www.live971freefm.com. We will be discussing the latest in skin care and plastic surgery, and may even get to go over some celebrity before and after photos. It's a great show, so if you get a chance, check it out! Here she goes again... What is going on with Tawny Kitaen? She's of Whitesnake fame and is on the current season of "the Surreal Life" on VH1. Tawny is quite a bit different than before, and appears to have had a good deal of plastic surgery. Starting from the top, she looks like she's had a brow lift with Botox, as her forehead is wrinkle-free and doesn't move. It's not visible on this "after" photo, but her brows are considerably higher than they used to be. She also appears to have had upper and lower eyelid lifts, which have taken away from the heavier look that her upper eyelids used to have. Her eyes now look more round and small, which can be a consequence of eyelid surgery. Her cheeks are consistent with cheek implants, causing them to be fuller and rounder than they used to be. I am not a fan of these plastic implants, because they tend to look stiff and make the smile look odd. Instead, I tend to use fat grafting, which is MUCH more realistic-looking and doesn't have that "stiff" look. She also appears to have had her lips augmented, likely with restylane or collagen. "Last year I had so many lines coming in at the side of my eyes up here. So I went in and got my eyes done, and I'm not happy about it. (The surgeon) is going to go in and fix that for me. They're too tight around the eyelids for me. It drives me crazy. I wake up in the morning, and Wanda says, "You look great." But I know what I want to look like. If we can fix that, then I'll be glad I did it. If we can't fix it, I'll regret it or get used to it. " Too bad for Kenny. His plastic surgeon has apparently taken too much eyelid skin off, making his lids too tight. This is a big problem that is not easily corrected. For some people time will loosen it up a bit. For others, the only way to treat overly tight upper eyelids is to lengthen the eyelids with a skin graft. It is very important for men to go to plastic surgeons who have a keen eye for not feminizing a man who doesn't want it. Overly tight eyelids can make men look more effeminate. I've given lectures on this locally. Hopefully Kenny's eyes will loosen up a bit! What is the most common plastic surgery for celebrities? The following comments are my opinion only, deduced after working as a Hollywood plastic surgeon for a time and becoming a pop culture and celebrity plastic surgery "expert." By far the most common cosmetic procedure is Botox. Botox has gotten so widespread in Hollywood nowadays that I notice when people do not have Botox more than when people do. This was most evident when I watched Tea Leoni act all flustered in that Adam Sandler clunker, "Spanglish." She had so many forehead wrinkles and crow's feet in that movie that I found it almost distracting to watch her. That many forehead wrinkles are rarely seen in beautiful Hollywood actresses today, so I applaud her for going au natural. As far as surgery goes, the top three in my opinion are liposuction, breast augmentation, and rhinoplasty. All three of these occur much more often in celebrities than in the normal population. Breast augmentations are often obvious (hello Mariah Carey! ), whereas liposuction can be difficult to determine (I've had people tell me that J. Lo has had it done numerous times), and rhinoplasties are either good (Halle Berry?) or bad (Jennifer Grey?). There are many more celebrities who've had these surgeries done than most people may realize. (I even believe that the great Julia Roberts has had her nose done!) At some point, the normal population may catch up with Hollywood celebrities in the amount of plastic surgery performed, but by then the celebrities may have gone onto bigger and more drastic ways to keep themselves young and relevant. Maybe they will have started cloning themselves by then. Just what we need, another Carrottop! There's a funny video at http://www.doubleagent.com/video.php?v=911. A genuine model??? Or a FAKE? Has Omarosa had a breast augmentation? In my opinion, it looks to be so! When she pushes up her breasts with her hands, they appear to be stuck in place. This is a likely sign of a breast implant that was placed under the muscle. It's realistic-looking though, since she is not too big. Maybe she is following in the footsteps of her best pal, Janice Dickinson. 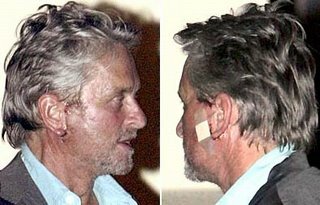 It looks like Michael Douglas has had a facelift! A few months ago he went out on the town with his scars very visible! It looks to me like a traditional muscle tightening facelift, with the scars in front of the ears. I am not a fan of the type of scar they gave him, as it is not as hidden as it could be. I suppose he needs to look young to keep up with the Joneses (Catherine Zeta-Jones, that is). 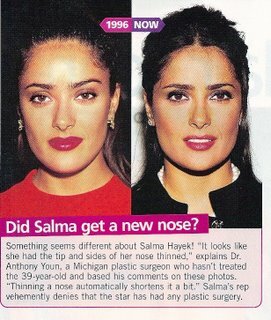 Has Salma Hayek had her nose done? The current issue of Life and Style Weekly has some interesting before and afters with my "expert" comments. It looks like she may have an "ethnic rhinoplasty." She looks great, and it was a very nice job. Now if she could only do something with that homely boyfriend of hers! Who has more plastic? Lisa Rinna or Tupperware? I commented on Lisa Rinna's lips in a previous post. I think she has gortex in them. This is a plastic implant that can be put into lips, but that I have making up my jacket. The Gambler has gambled on some plastic surgery...and won?? 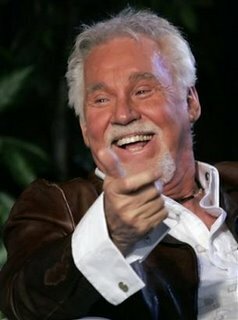 Kenny Rogers was on "American Idol" tonight, looking pretty decent. I believe he's had upper and lower eyelid lifts (blepharoplasty) performed, making his eyes look wide open. It's a good job, since it doesn't make him look too effeminate, like some men who appear to have had work done (Michael Douglas - eyelids, Robert Redford - eyelids, David Gest - yikes!). An upper eyelid lift takes about an hour, can be performed with twilight anesthesia (not general), and has a recovery time of a week or so. Pain is almost nonexistent. By the way, I thought it was a lackluster night tonight on AI. I'm rooting for Chris, Kelly Pickler, or Mandiva (my favorite, Lisa, got voted off last week!). Bucky, Taylor and Ace need to hit the road! 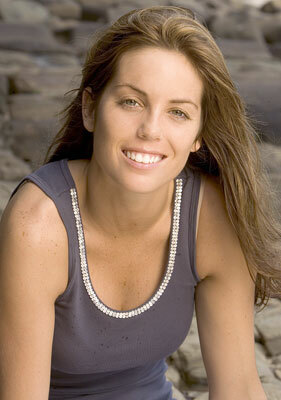 The television show "Survivor" always seems to have a female contestant who reveals that she has breast implants. Although it is not always obvious at the beginning, after several weeks of near starvation, all the body parts get smaller except the round breasts. I wrote about this phenomenon last month. I am enjoying watching this season's "Survivor: Exile Island," although my favorite contestants are all getting voted off! That leaves people like Danielle (above) vying for the one million dollar prize. She appears to be the contestant this time who has implants, although they do appear to be a better job than most of the others. I'm rooting for Austin to win, although it looks like it may end up being that tool Shane. I'd like to give a quick shout out to all the readers of Trent's "Pink is the New Blog." One of his good friends works in my office and I've become a fan of his site. It is one of the reasons I went ahead and started my own blog! I hope you enjoy it and even learn a couple things!